Product redesigns and 2.0s are moments of accomplishment and celebration for product teams. But with change comes anxiety for many users. Imagine this: Moments before a big meeting, you open up your daily tool of trade to pull a report that you know your boss will want. You know the software inside out and know exactly how to get the information that you need. Just in time. But suddenly, chaos erupts. There’s an update. The product has been redesigned and you have no idea what to do. Change can be disruptive and jarring. When handled poorly, big product changes risk alienating power users, even if the net gain in value is there. 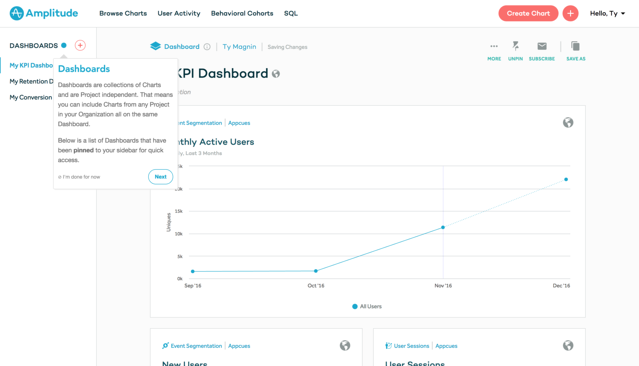 But when done well, product redesigns give users more value and provide fresh opportunities to re-engage churned customers and attract some new fans. Launching a new design or product 2.0 gives product teams the rare chance to reignite that new-user-high. 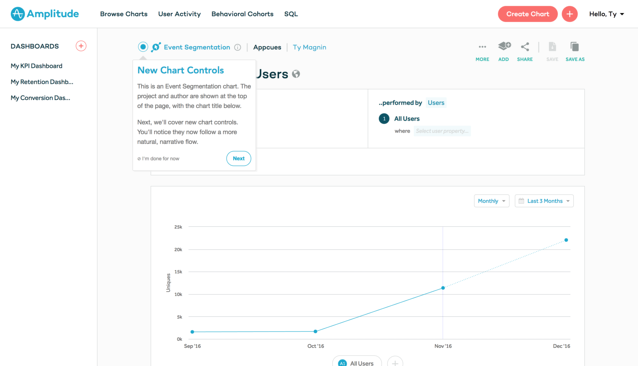 Getting the message and roll-out right is crucial to making users love the new platform. Here at Appcues, we've joked that 2017 is “The Year of the Redesign.” Our sales and customer experience teams constantly relay stories of big UI changes and connect with teams who have recently rolled out a new and improved product. We've collected the very best tips to launching a product redesign, aforng with some great examples (in the second half of this post). A soft launch is a great way to provide flexibility in adoption, without sacrificing any of the excitement of a full launch. 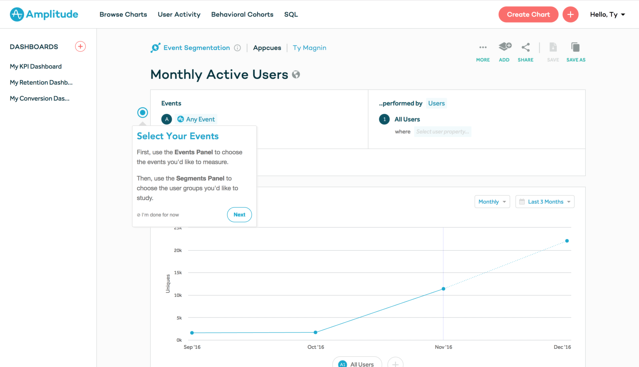 Soft launches are widespread among SaaS products because they benefit users and product teams alike. If a launch is opt-in and optional, make that very clear to users. Knowing that the whole platform is still being worked on will help level expectations—users will know that everything is not perfect, and will be more apt to give you constructive feedback. 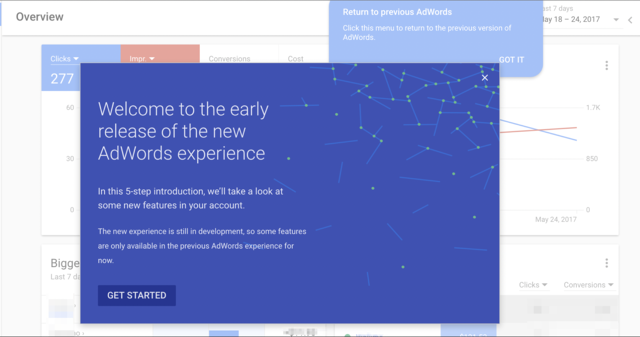 ‍While there’s a lot going on here, AdWords does a good job emphasizing that the new design is still under construction. Don’t blindside users with a redesign and force them to adopt a new platform when they’re not excited about it. 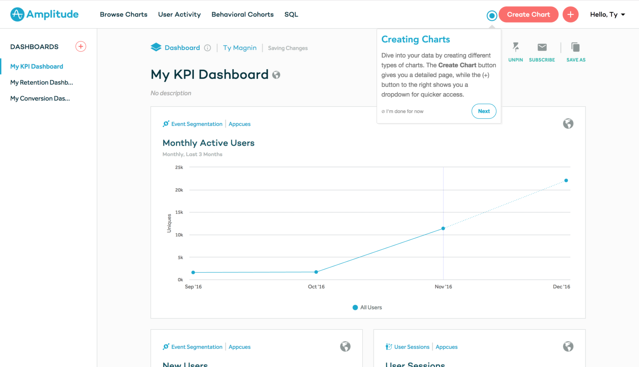 Users are most primed to adopt, and love the new platform, when they’re ready for the change. Plus, people fall into different camps here—some may have been waiting for the new release and adopt instantly, while others may need to take a while before they’re fully ready. 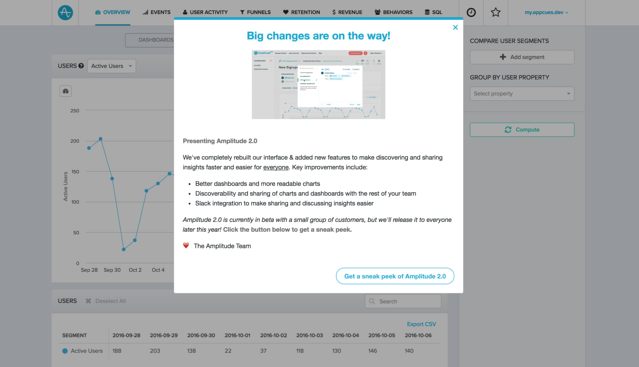 The product analytics platform Amplitude announced their new 2.0 months ahead of its full release. ‍Previewing a 2.0 ahead of time lowers risk and plants the seeds of excitement. 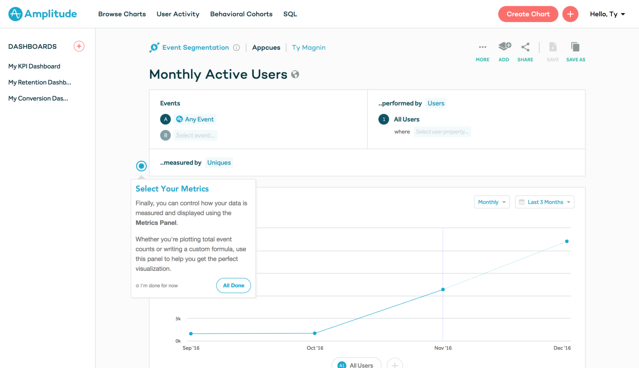 A pre-launch announcement may not be necessary for all products, but people often spend hours a week in an analytics tool. Announcing changes ahead of time avoids surprising users when they’re in the middle of a mission-critical task. If the older version of the product has a depreciation date on the roadmap, be sure to communicate that very clearly. 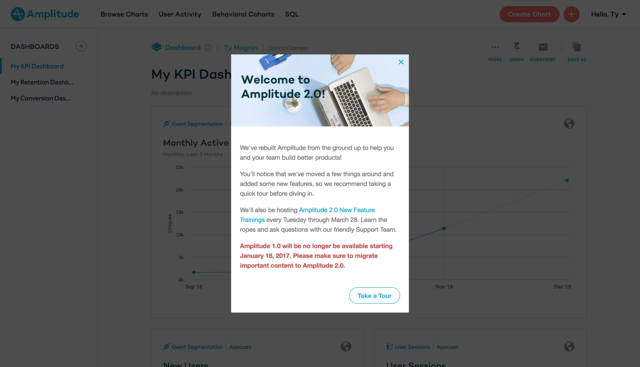 Amplitude’s 2.0 announcement hit all the right notes in setting expectations and preparing customers for what’s ahead. 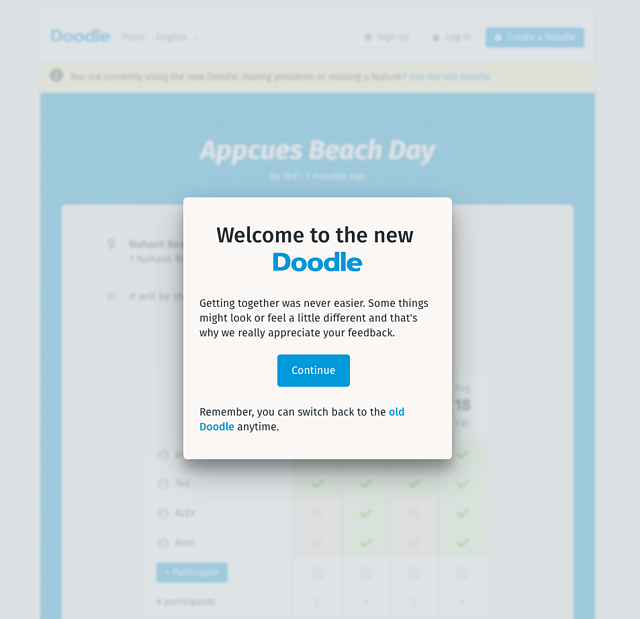 ‍This modal conveys everything you need to know about 2.0. For more inspiration from Amplitude, jump ahead. Moving is only fun if you’re getting an upgrade. You have to make sure all the necessities are in place. Customers won’t love a new product if their content and bits of product personalization are missing. Make migration of assets as seamless as possible. The other half of the equation is conveying what’s new and improved. Tried-and-true user onboarding principles are key to making users feel comfortable, yet excited about getting something even more valuable. "You need to deliver value off the bat. My whole job is time-to-value. Convey all the benefits, and show what are we doing for you. A lot of those value propositions are hidden in the design. Give them a taste and if they ask for more, guide them through the product." While it requires a lot of work, a product redesign is a moment of celebration internally and externally, says Sarah. Conveying a tone an excitement across all communications from marketing emails to in-app messages to help docs can make a big difference. 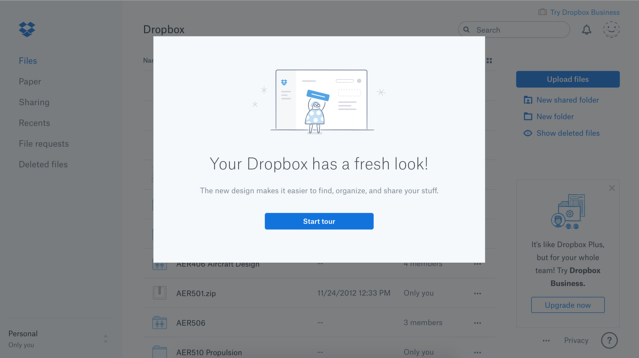 Product redesigns often launch with a welcome message followed by a product tour. This is a great way to 1) make sure users see the notification, and 2) communicate broad value and walk through smaller, but important, UI changes. For more inspiration, here’s how a few companies have recently launched their product redesigns. The product tour as a state design—a separate bottom panel combined with interactive elements on the main window—is popular these days. It looks slick, but can feel heavy-handed for users who want to explore on their own. 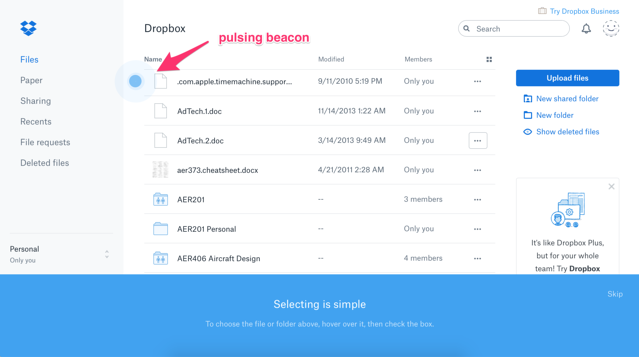 Dropbox provides a clear out (“exit” at the top right of each panel) at every step. 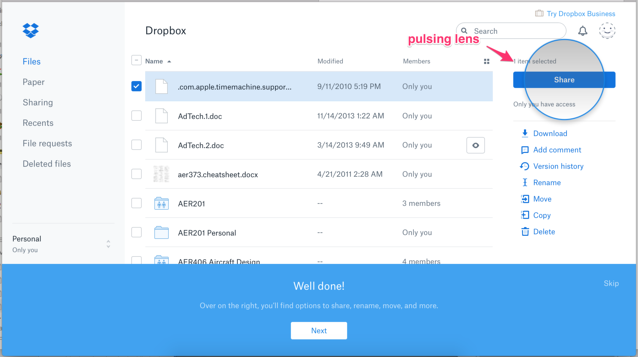 Dropbox uses straight-forward and pithy copy throughout the product announcement. Each message contains just two lines of text and plenty of white space. This can make a long tour feel more digestible. 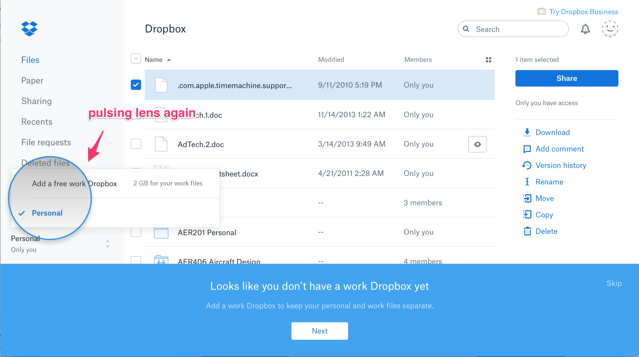 There’s even a lifecycle nudge (adding a free work Dropbox) baked into the flow. This is a detail that might not make sense in a new user flow, but is perfect for a 2.0 onboarding flow. 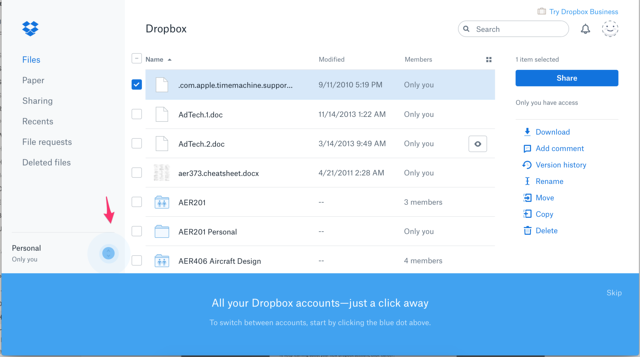 Dropbox includes a success message at the end to thank users. The green color change is a subtle, but nice, way to make the success message stand out a little. Analytics platforms can be complex to learn since they’re so robust. Amplitude’s clean UI has always reflected approachability. With 2.0, they double-down on being powerful yet accessible. The initial welcome modal tells users why taking a product tour is beneficial (“You’ll notice that we’ve moved a few things around and added some new features, so we recommend taking a quick tour before diving in”). Amplitude continues to use clear language throughout the tour about what different parts of the product can do, and more importantly, why each component is valuable for customers. Amplitude is super clear about when 1.0 will be depreciated. 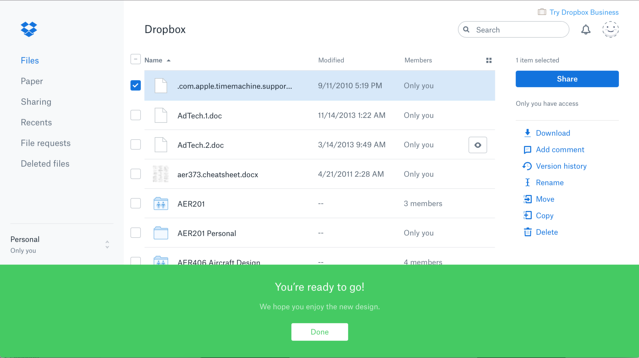 This flexibility gives users plenty of time to transition when they’re ready for it. Google Forms is an easy product to use, and the tour fits the simplicity of the product. No snazzy images or fancy designs needed. Product redesigns show customers that you’ve listened to their feedback and made tangible progress towards helping them achieve their goals. Setting customer expectations and communicating value clearly can help off-set risks. 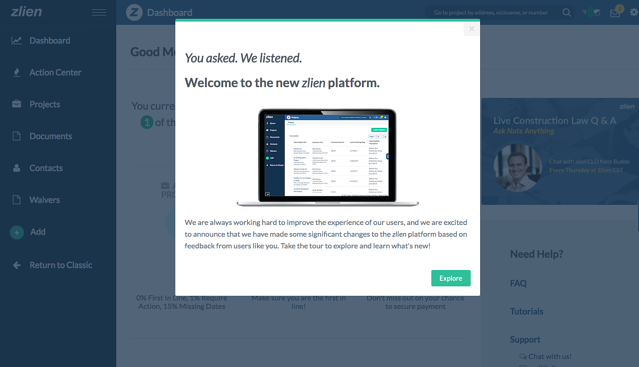 More importantly to keep in mind is that like new user onboarding, launching a redesign or 2.0 isn’t really ever done. Sure, customers may have all migrated over, but learnings and potential improvements are still ripe. At Amplitude we talk a lot about how the 1.1 release of a product is typically more important than the 1.0 release of your product, and we very much feel that way about 2.0. The subsequent learnings and improvements we've made since launch are the direct result of us learning from our customers early and often. With each iteration of the product, keep learning and helping customers through every improvement. Product change only means progress when it’s backed by customer empathy and continuous value delivery.